Have you ever thought to yourself, “Hmm…he should know that already…” when listening to a student struggle to decode a word, or when you notice that a student misspelled a word? Gaps in phonics knowledge (students’ understanding of and ability to apply sound and spelling patterns) are super common. For example, sometimes you end up with fifth graders who are decent readers but can’t spell long vowel patterns they should have mastered back in second grade! Unfortunately, these gaps can create big problems for students. They can create decoding challenges that slow down their reading. Slower reading can then lead to poorer comprehension. Gaps can also result in poor spelling abilities. And sure, spell check is great, but everyone needs to write by hand sometimes—and not having any idea how to spell a word will definitely slow you down! However, the good news is that we CAN take steps to prevent gaps and to address them when they show up. I recently chatted with Kelly Hoover, from Ascend Learning / Smarter Intervention, about what we can do about these gaps. 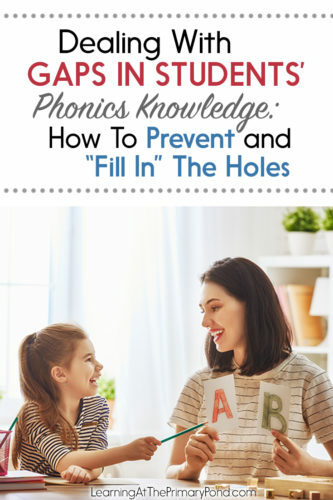 She and the Ascend team are experts at working with students who struggle with skills like phonics, and she had some great tips (and freebies!) to share with me!